June 28, 1937: The Junior League of Greater Fort Lauderdale was founded as the Fort Lauderdale Junior Service League, a non- profit organization, for the purpose of providing the community with willing volunteers in civic and child welfare work. The founders were Susan B. Anthony, II and Charlotte A. Carlisle, with 15 charter members. Mrs. Clinton (Virginia) Gamble was elected as the first president. 1940: The Thrift Shop was opened at the corner of Broward Boulevard and Andrews Avenue on the site now occupied by the Broward Governmental Center. 1942: Legacy project, Jack and Jill Children’s Center, was established. 1947: The first Follies fundraiser was held. 1953: Opened Legacy project, the Broward Mental Hygiene Clinic…now known as the Henderson Mental Health Clinic. 1958: Accepted by the Association of The Junior Leagues of America, Inc.; Founded Legacy project, the Fort Lauderdale Art Center…now known as the Nova Southeastern University Art Museum of Fort Lauderdale. 1966: Recognized by the Fort Lauderdale News (now the Sun Sentinel) as the Outstanding Club of the Year. 1969: Employed first paid manager for the Thrift Shop. 1970: Provided financial support and volunteers to show the film “Drugs Are Like That” in Broward County elementary schools; Sent a letter to the City Commission asking that the New River Inn and surrounding area be declared a historic site; Allocated funds for the purpose of the relocation and restoration of the King-Cromartie House. 1971: Relocated and restored the King-Cromartie House; Historic preservation efforts and education on local history continues throughout the 70’s; Held the first night Junior League meeting. This led to establish the Fort Lauderdale Historical Society. 1973: Employed first paid officer manager. 1975: First year of offering a complete Provisional course in the evenings for women in the workforce. 1977:After 3 years of planning for Legacy project, the New River Exploratorium opens…to become known as the Discovery Center and known today as Legacy project, Museum of Discovery and Science. 1978: Planning initiated for the Legacy project, Kids in Distress, Inc.
1980: The award-winning cookbook – the League’s first - Sunny Side Up was published. 1985: Established our first Community Advisory Board com- prised of community leaders that provide counsel and guidance on current operations as well as setting the course for the future. 1990: The League was given ownership of the property located at 704 Southeast First Street, which became the location of our headquarters. 1992: Research was completed for Legacy project, the Susan B. Anthony Recovery Center; South Florida Women’s Business Conference voted in as a fundraiser. Continues for five years and is showcased at a national Junior League conference in 1994. Speakers of note included Coretta Scott King and Katie Couric. 1993: After 5 years of planning and collaboration, the Legacy project, S.O.S. Children’s Village opens. 1994:Legacy project OUR House had its grand opening. 1996: The Junior League was recognized as the Outstanding Volunteer Organization by Broward House at the National Philanthropy Day awards luncheon. 1997: Our Endowment Fund is established at the Community Foundation of Broward with initial gift made in honor of our 60th Anniversary. 1998: The League’s second award-winning cookbook, Made in the Shade, was unveiled in December and named the official cookbook of the city of Fort Lauderdale. 2000: Sponsored the Junior League Play Station at Holiday Park, an ADA accessible playground. Funds for the project were raised over a four year period. 2003: Focus strategically shifted to raising funds prior to committing to projects. During this approximate two-year period, emphasis was placed on hands-on community involvement. 2006:Transitional Independent Living project was initiated with the United Way and Community Foundation of Broward to address the needs of youth aging out of the foster care system. 2008: 3rd League cookbook, Paradise Served, was published. 2009: Healthfully Ever After, a 2nd grade nutrition education curriculum, was disseminated to teachers. The program was recognized as Partner of the Year from Broward County Public Schools for its positive impact on the childhood obesity epidemic. 2009: The Fort Lauderdale Independence Training & Education (FLITE) Center opened its’ doors to the community in July as a one stop resource center for youth aging out of the foster care system. 2014: Human Trafficking is voted in as the next Community Impact area. 2017: The Junior League of Greater Fort Lauderdale celebrates 80 years of service in Broward County. 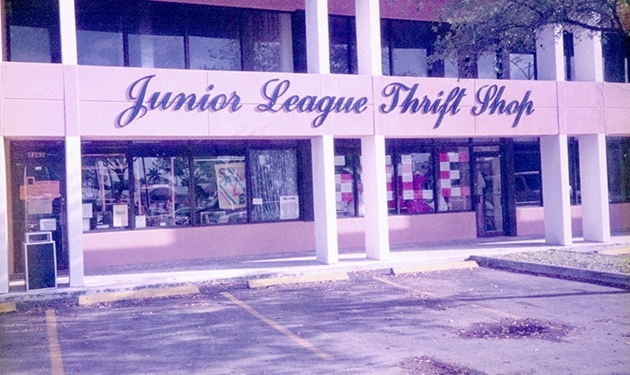 2018: The Junior League of Greater Fort Lauderdale sold its headquarters property at 704 SE 1st Street. It began leasing office space from the Marine Industry Association of South Florida. This time line was compiled as a snapshot of significant events in our history. It is not meant to be all-inclusive. The League has impacted countless other organizations over the years by providing financial support and trained volunteers. We have also had the privilege of providing support during the early stages of many other non-profits in our community.